The Sweet Memories Bouqet in Chicago IL - Wall's Flower Shop, Inc. The Sweet Memories Bouquet is a charming way to celebrate any of life's most treasured moments, great and small. 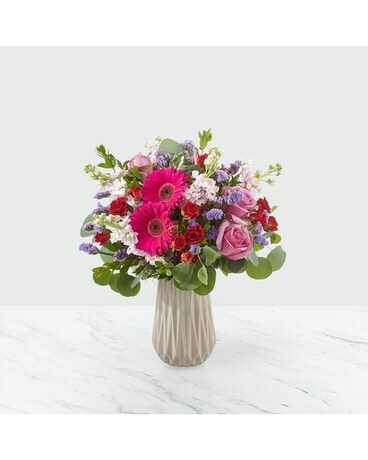 Blossoming with unmatched color and texture, this fresh flower arrangement brings together lavender roses, red spray roses, pink stock, lavender statice , hot pink gerbera daisies and lush greens to create a gorgeous presentation. 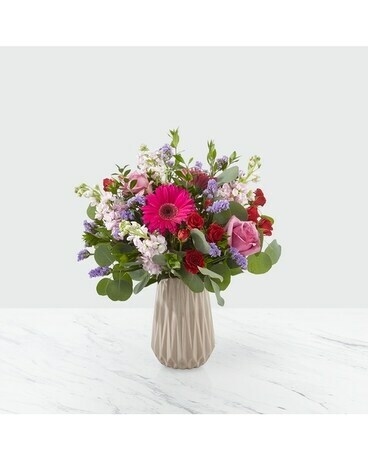 Arriving arranged in a soft gray ceramic vase to add even further texture and interest and give it an appealing vintage vibe, this spring flower bouquet is ready to help you send your warmest birthday, anniversary, or thank you wishes.